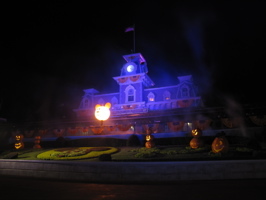 We went to the first Mickey’s Not So Scary Halloween Party of the year – it was a nice time to go, with few crowds (later in the season the parties are heavily attended). 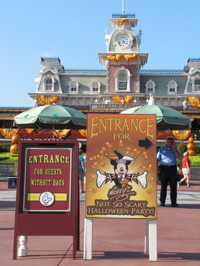 There was a sign at the entrance to the security area (below, left) that let guests know about the party. 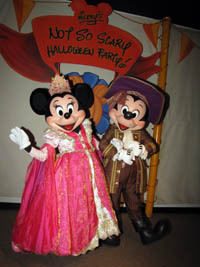 Mickey and Minnie Mouse are now greeting party goers inside the Judges Tent – there was a delay in everyone getting to meet them, but we made it in and you can see that they are now dressed in their Pirates and Princess outfits (below, right). 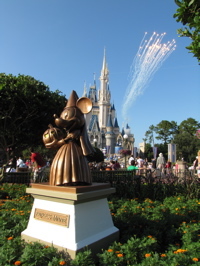 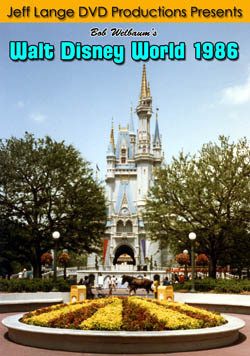 Daytime fireworks shoot off behind the statue of Minnie Mouse with a pumpkin (below, left). 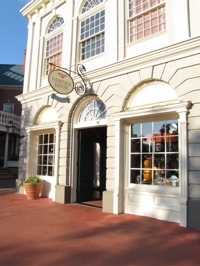 The Heritage House (below right) has been turned into a Halloween store until the end of October, while the Presidential merchandise has been moved to Ye Old Christmas Shoppe. 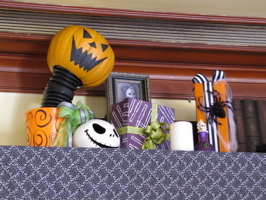 Many Halloween displays delight the guests entering the store (below, left). 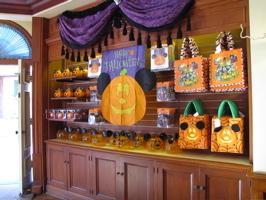 Much of the merchandise revolves around “Nightmare Before Christmas“, but the wall at the back of the store (below, right) has a plethora of Mickey Halloween merchandise. 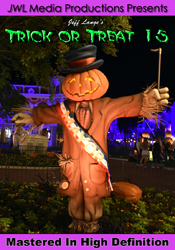 The best value was a trick ot treat bag for $2.95! 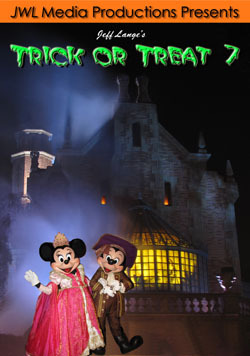 The Main Street Train Station (below, left) looks spooky for Halloween. 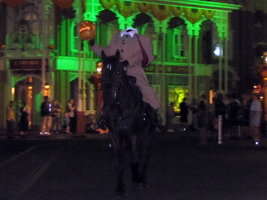 The Headless Horseman (below, right) precedes the parade, riding down Main Street with a jack-o-lantern in hand. 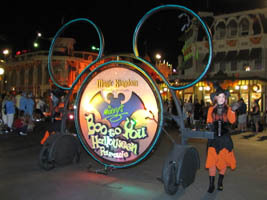 Mickey’s Boo-To-You Halloween Parade (below, left) is a highlight of the evening. 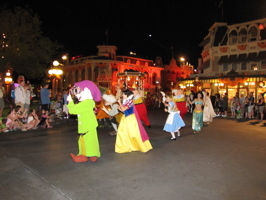 Dopey, Snow White, Alice and Jasmine look through their masks (below, right). 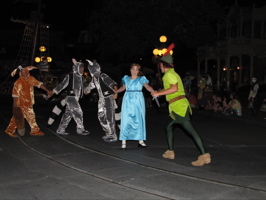 Peter Pan leads Wendy (below, left) down Main Street. 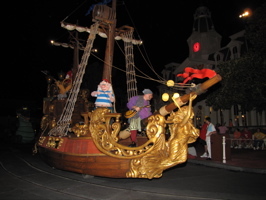 Smee (below, right) stands watch on the pirate ship. 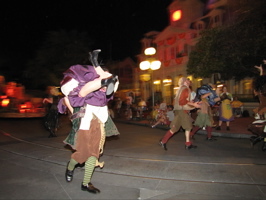 A pirate grabs his wench (below, left) and carries her over his head! 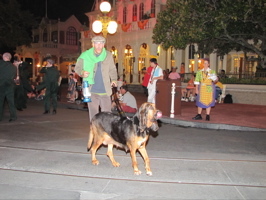 The Haunted Mansion caretaker comes by with his bloodhound (below, right). 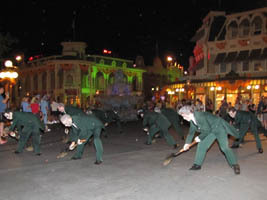 The grave diggers (below, left) scrape the ground with their shovels. 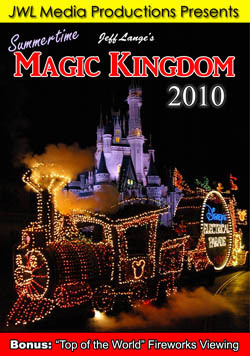 They are one of my favorite parts of the Boo-To-You Parade! 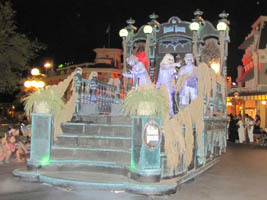 The Haunted Mansion float featuring the Hitchhiking Ghosts (below, right) is a scary sight indeed. 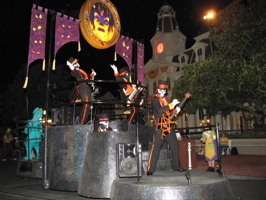 This Villains float (below, left) features a skeleton band and unique music. 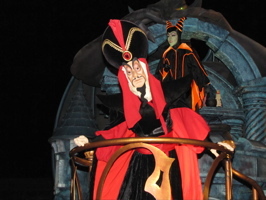 Jafar (below, right) looks dastardly as Malificent is seen over his shoulder. 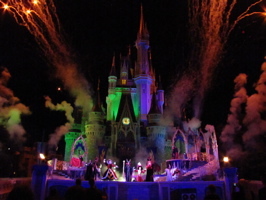 Bonus Video – Mickey’s Boo To You Halloween Parade 2010, Mickey’s Not So Scary Halloween Party 2010 – Magic Kingdom – The “Boo to You” parade at the Magic Kingdom, Walt Disney World at Mickey’s Not So Scary Halloween Party, the first party of 2010. 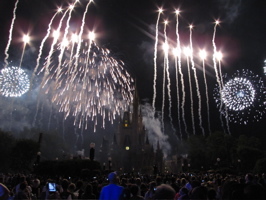 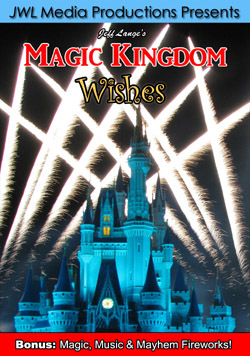 Happy HalloWishes (below left and right) is an incredible fireworks show, you’ll want to see this one from Main Street to see all the great lighting on the castle! 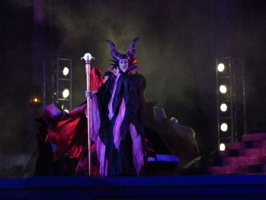 Disney’s Villains Mix & Mingle show features Malificent (below, left) and many other favorite Disney Villains. 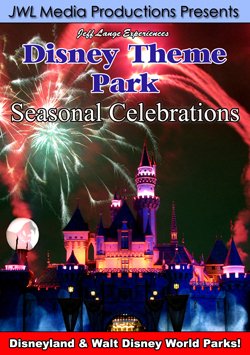 This year includes the addition of Dr. Facilier from The Princess and the Frog. 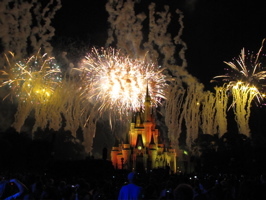 The show features pyrotechnics (below, right) and a lot of high-energy dancing! 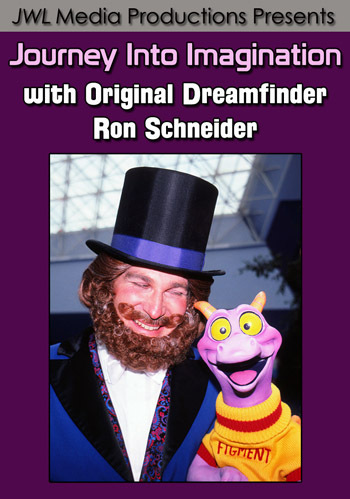 After the show, the characters do mingle. 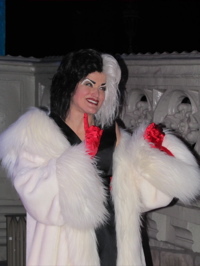 Cruella De Ville (below, left) delights in compliments from the crowd. 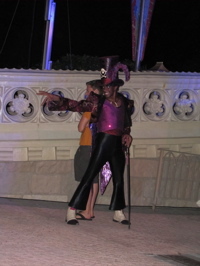 Dr. Facilier (below, right) poses with a guest. 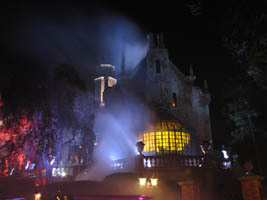 The Haunted Mansion (below, left) is bathed in eerie fog. 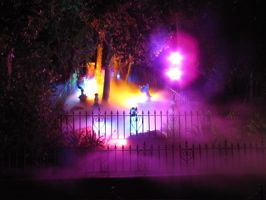 The Pet Cemetery (below, right) also is enveloped in the fog and lighting – take a stop there and you can visit Mr. Toad, who can be easily missed in the back. 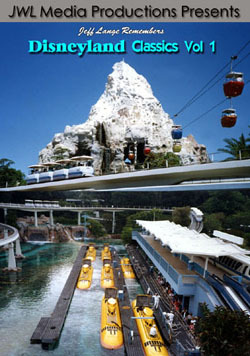 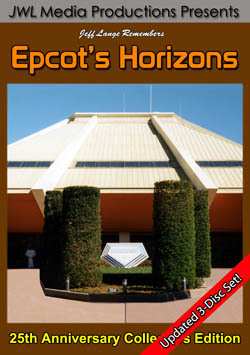 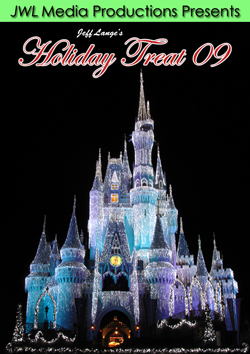 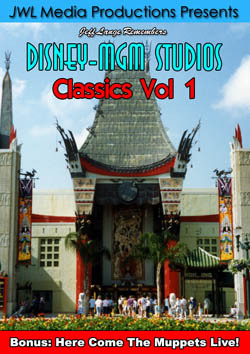 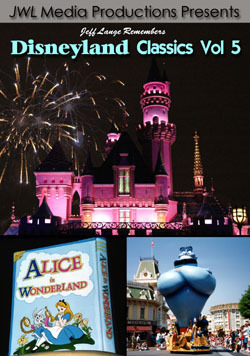 Get ready for Halloween (Mickey’s Not So Scary Halloween Party’s 2003 – 2010 Available) 2010 Edition Available Now!